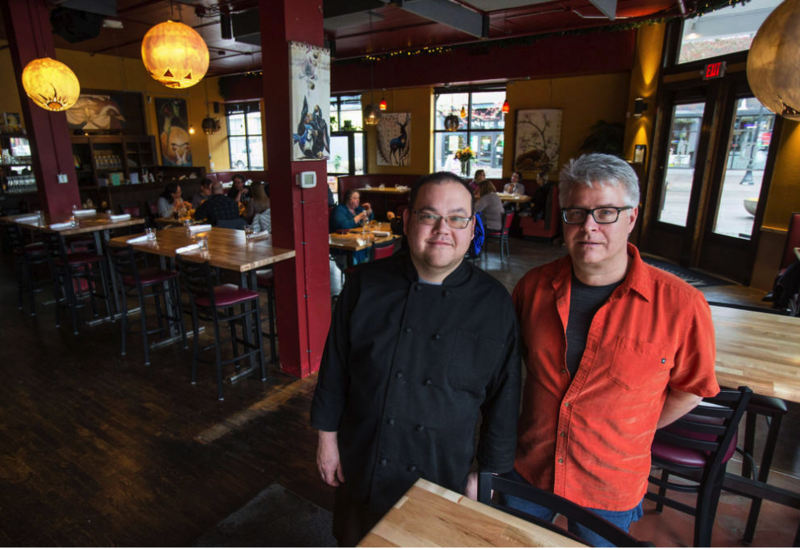 The Davis Restaurant has evolved since it first opened in 2007. The name — for one — is different. It used to be Davis’ Restaurant, but people found that harder to say, said Tom Kamis, a co-owner from the beginning. The façade also has changed, with a new doorway in the building’s corner, which had previously been a problem area for fights and litter. And Kamis has a new business partner, Jeff Hardinger. A chef, Hardinger has enlivened the menu with items that could be called Pacific Northwest cuisine, comfort food and world favorites from places such as Thailand and the Middle East. The two have known each other for a couple decades, Kamis estimates, and were roommates way back when they both worked at one of a number of local restaurants. They started the new partnership when Hardinger returned after several years in New York City. Now, they’re planning to open another eatery together, Krob Krua, which will begin serving food at WildCraft Cider Works sometime this spring. It will feature Thai specialties. A pop-up dinner featuring Krob Krua food and WildCraft beverages will take place at The Davis Restaurant probably in late March. Question: What food do you think you’re known for at The Davis Restaurant? Kamis: Right now, there’s such a balance across the menu of what we’re selling. I would say one thing: We have dumplings that we’re doing with chicken and foraged mushrooms. I think that if I was going to say one item that has really blown up, it’s that. … I see people in the kitchen every day making dumplings, trays and trays of them. … The steak frites, the burger, the mac and cheese. … Then we have specials that change almost weekly. We just got through a rockfish special that we sold out two days before we thought we were going to be able to. Hardinger: There’s a rib dish that’s really popular. My wife and my wife’s sister are from Thailand and they’re working with us. It’s green papaya salad, which is som tam in Thai. And then it comes with a sweet chili pork, which is sort of reverse braised, simmered and then fried hard and then tossed in the sweet chili sauce. That’s a big seller as well. And then, of course, right there next to it is steak frites and burger. It’s kind of a weird dichotomy. It’s working. … I’ve got a kebab dish on there right now that’s selling as hard as anything else. Israeli-influenced kofta kebab with lamb and beef with hummus. Question: How do you decide what to make as a special or what to put on the menu? Hardinger: We’re replacing like with like. The lamb dish that was a lamb shank for the winter now becomes a lamb kebab, so it’s a little bit lighter. I kind of keep similar proteins in there and play with whatever’s with them or play with the whole dish itself. … The salmon dish before was more of an Asian-fusion dish with an orange miso glaze and a stir fry. And now it’s mashed potatoes and fried brussels sprouts and a cranberry vinaigrette for the winter. Question: Of course, you have a full bar here. What do people like to drink? Kamis: Our signature cocktails sell more than any other drinks. Kamis: (Now) strangely enough we have a sparkling sangria. It’s selling like mad. … We try to hit the same thing: we have a rum, a scotch, a whiskey, a rye or a bourbon. We just try to make it so that there’s something on the menu for everybody. I think that’s really important. Question: What can you tell me about your tasting dinners? Kamis: We have two coming up in March. Hardinger: We have the Deschutes (Brewery’s The) Abyss dinner. Kamis: They allocate a release every year between December and February. I’ve been saving up five years of them. … It’s more than beer. They’re always really strong. The one that we’re serving is almost 15 percent (alcohol.) So it’s like drinking wine, and it’s styled like wine. Hardinger: A lot of them have been barrel-aged. Question: Why do you think people like to come to The Davis Restaurant? Hardinger: We’re getting all of the people downtown. … We’ve got four theaters within a block and a half of us, and the Hult Center and those all definitely provide us with clientele. It’s been good to have people down here and participating. The ArtWalk (on the first Friday of) every month is great. It feels nice down here on those days. Downtown is downtown. It can always be kind of tricky. Cara Roberts Murez is a freelance writer who lives in Eugene. She has worked as a writer in Oregon for the past 20 years. Menu: A mix of food that features Pacific Northwest ingredients, comfort-food favorites like burgers and steak fries, and world cuisine, including Thai specialties. Kitchen hours: 11 a.m. to 10 p.m. Monday through Thursday, 11 a.m. to 2 a.m. Friday and Saturday, with brunch 11 a.m. to 3 p.m. Saturday; closed Sunday.